"Big Movement" identifies instances when excessively large movement (either up or down) has occurred in a financial instrument. This type of analysis is interesting for both trend followers as well as swing traders. For trend followers, it may be a possible sign of a new trend formation. For swing traders it is a possible sign that a correction may be coming. Autochartist keeps track of every instrument’s typical movement, and when an exceptional movement occurs, the trader is alerted to this event. Autochartist looks back up to 600 candles, for every instrument, for every direction, for Hourly, 4 Hourly, and Daily candles and generates a histogram of movement sizes in percentage terms. That means we keep track of 5 distributions for every instrument. We can see from the above histogram, that over the last 600 candles, about 40% of the time we only get movement between 0.25% and 0.5%. We can also see that about 30% of the time we get movements greater than 0.5% and smaller than 0.75%, and so on. If we add up these numbers until a threshold of 95%, then anything above that would be regarded as “out of the norm” by more than 2 standard deviations. 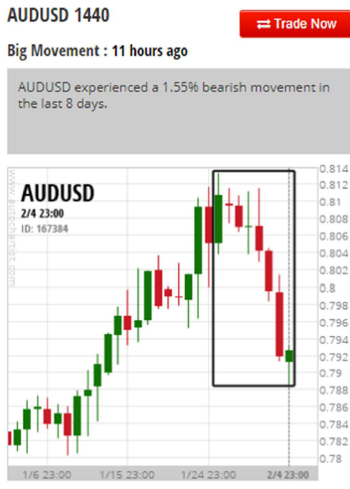 That means that if the AUD/USD Daily chart has a movement larger than 2.5% it would trigger a “result” in Autochartist. For the example above, that would be (0.814 - 0.788)/0.814 * 100 = 3.19%, which is greater than the 2.5% threshold. Each symbol, data interval and direction may result in a different probability distribution. Furthermore, because we use a moving window of historical data to recalculate new distributions every day, the results may change over time.